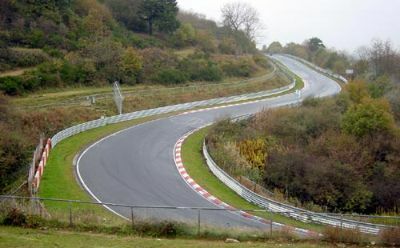 Short section down from the tight Wehrseifen to Exmuhle. 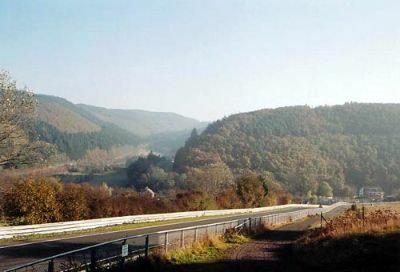 The track passes over the road into Adenau. 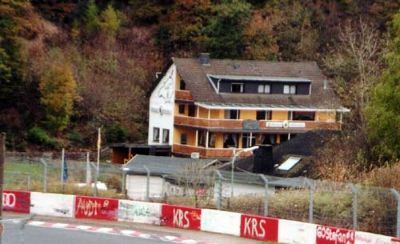 The bridge is actually at Briedscheid, but is commonly referred to as Adenau Bridge, and is also the location of the hotel we have stayed at, Hotel An-der-Nordschleife. Beware slower (and larger!) vehicles around blind corners! 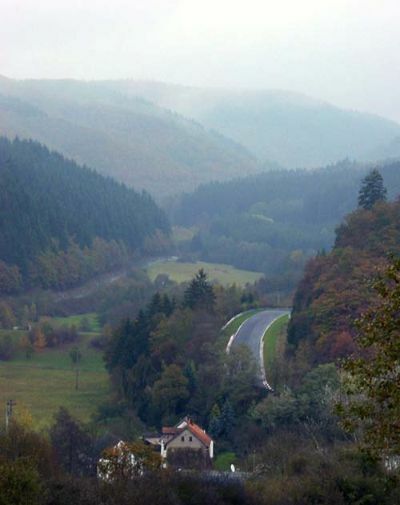 ...and then down towards Breidscheid and Exmuhle at the bottom of the hill. This picture was taken on the day of our bike ride - a beautiful clear frosty morning. Wehrseifen, with Adenau in the background. Early morning before the track was open. These chaps jumped out of the A Class to inspect the Armco. The skids on the left of the picture are evidence of why the inspection was needed! There had been a race the day before. 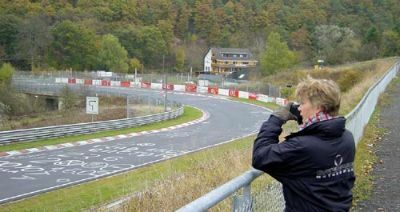 A short stroll up hill from Adenau Bridge and the main road, and an excellent place to car spot overlooking Wehrseifen, where you are close to the action and the cars have slowed down for the corner. Looking down the hill towards the bridge - Breidscheid - you can see the path on the right of the picture. With its proximity to the main road this is a popular spectator point. From up here you can just get a glimpse of the track as it swoops around Exmuhle and off up the valley towards Bergwerk. The town of Adenau is on the left. 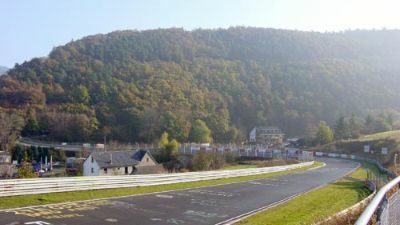 If you are cycling or walking around the track, you follow the road that you can just see of the left of the picture, and then turn onto a track that brings you back to the track at Bergwerk. 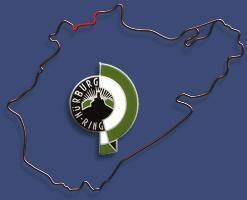 Nurburg Driver Instruction School Audi S4's braking into Breidscheid. 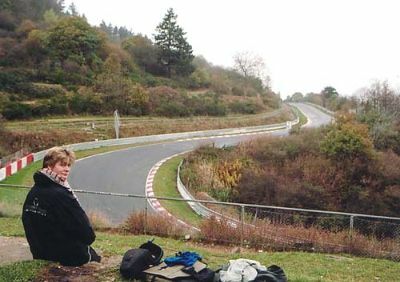 On the day that Tessa and I cycled around the Ring perimeter tracks the track was being used by the Nurburgring Driver Instruction school. Using Audi S4's they seemed to be working in groups of 3 or 4 cars, and working on particular sections of track - the only way to learn the circuit. So one group of 4 cars would drive past. Five minutes later the same group would return, driving back past us the wrong way around the track back to their starting point, then do the same thing again. It meant we always had cars to watch as we made our way around the track, but it also means that in some of the pictures coming up the cars are driving the wrong way around the circuit - which may be confusing to some! At the same time as taking lots of pictures I was also shooting some video and on this quite frankly they all look as if they are lost!! 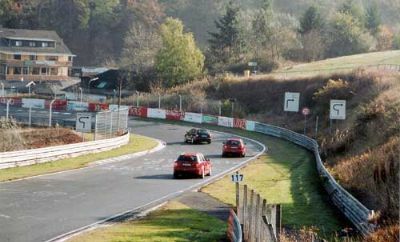 There is actually an entrance onto the track at Breidscheid/Adenau Bridge. This can be seen in the photo above - you can just about make out the barriers that let you onto the track in exactly the same way as the ones at the main entrance. You can buy tickets here at the little 'kiosk' which is also a small (and very smokey!) bar. They also sell various 'Ring souvenirs. 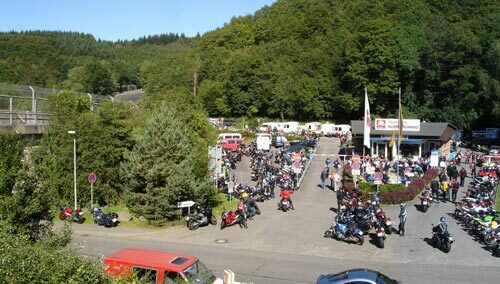 Bright, dry weather brings out thousands of bikers! The entrance is only open to the public during the weekends, and you purchase a ticket valid for 1 and a half laps. I don't think this entrance is used as a general exit though. I am also pretty sure that an emergency vehicle is based here as well as back at the Grune Holle entrance during public days. 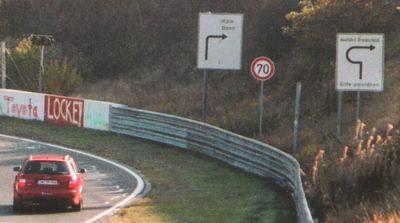 Despite not really being an exit there is the bizarre sight of two road signs on the track just before the bridge, as shown below in the picture. One is a directional sign for Bonn and Koln (Cologne) almost as if the track were part of a daily commute run?! Destination signs just before Adenau Bridge! 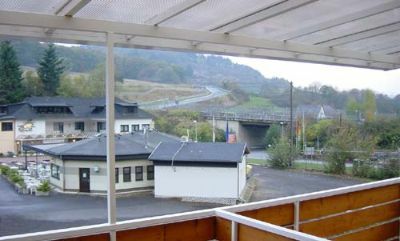 This is the view we had from our balcony when staying at the Hotel An-Der-Nordschleife. You can see up the track towards Wehrseifen. The two buildings on either side of the road seen above are bars which serve huge portions of good basic food, eat in or take away. Very convenient. Petrol station, supermarket, beer warehouse and Adenau under the bridge to the right. Same balcony as seen from the track! 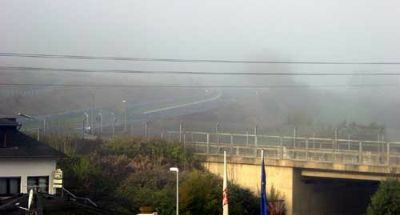 You can also just about see the evidence on the concrete bridge parapet of people who miss-judged the braking down the hill! Balcony view on our bike ride day, first thing in the morning. The mist gradually lifted to produce a gloriously sunny winters day. 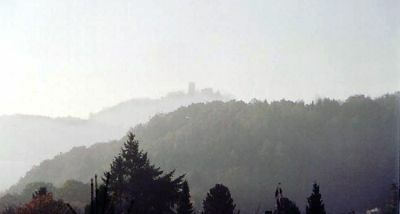 Balcony view of Nurburg Castle through the mist. 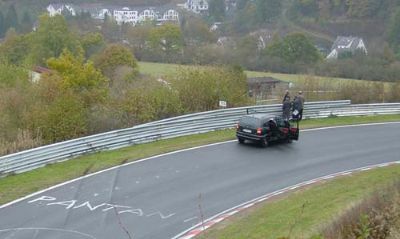 This shot also gives some idea of how much the track has dropped down in elevation from the start at Nurburg. Now for the climb back up....! 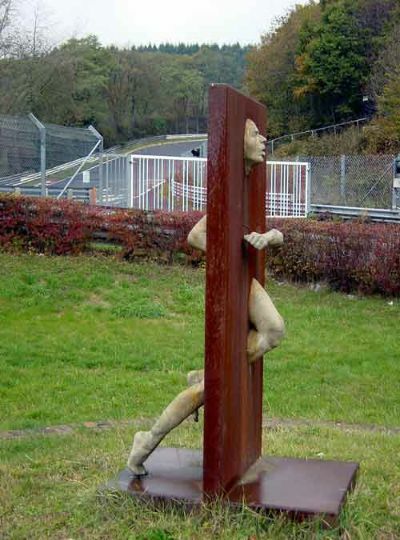 It is either a German sculpture or a new type of crash barrier?! Behind the 'art' you can see the Adenau entrance to the track and behind this you can see the track climb up to the right around Exmuhle. 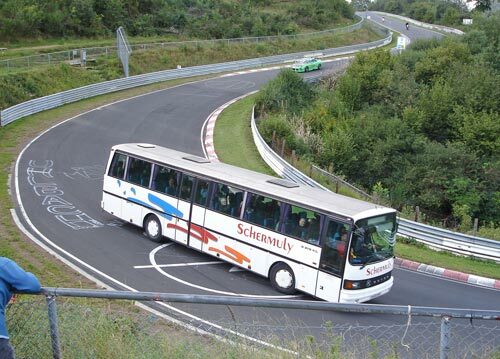 With a long straight towards Bergwerk to follow, carrying speed up over the crest out of this corner is vital. Our exhaust bottomed out at this corner.